Highest level since April 2011. It’s not just the Brick & Mortar Meltdown anymore. A company files for Chapter 11 bankruptcy protection from creditors in order to try to restructure its debts under the supervision of a judge. This normally involves are large reduction in debt and the transfers of part or all of the ownership of the company from pre-bankruptcy owners (shareholders) to creditors. Most often, shareholders lose everything. Some unsecured creditors too lose everything. Secured creditors are often made whole. And many creditors in between get a haircut, in return for some ownership. The hope is that the company can “emerge” from bankruptcy with less debt and keep operating. Bankruptcy filings are seasonal and usually peak in April, along with tax season. So the March jump doesn’t augur well for April. 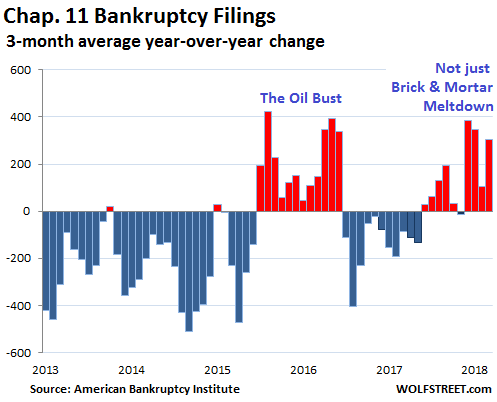 The low points in Chapter 11 filings normally occur late in the year, before or in December, except last December when filings spiked 61% from November, to the highest level for any month since April 2013. 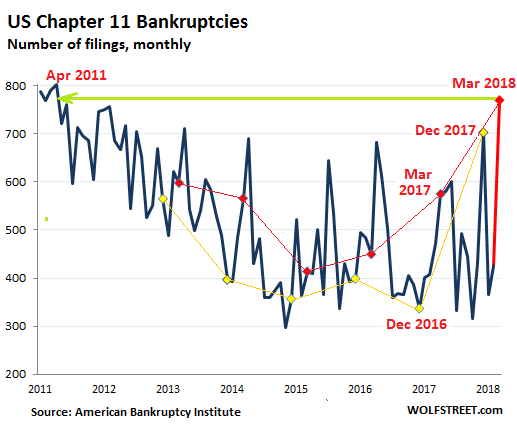 In March, it got worse when Chapter 11 filings spiked to the highest level for any month since April 2011. While the December 2017 spike was truly special, in January and February, filings were close to where they’d been a year ago, and I thought, OK, maybe December was just a blip. But now there’s the March spike, the second highest spike since the end of the Great Recession. The by now well-documented Brick-and-Mortar retail meltdown is responsible for part of it. 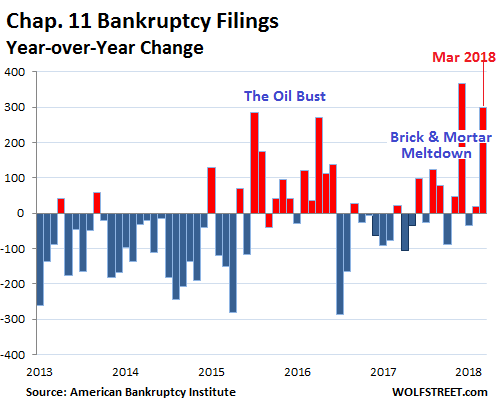 Retailer bankruptcies of all sizes have been piling up in large numbers since 2016. They all started out as Chapter 11 filings, though many of them later turn into messy liquidations, like Toys ‘R’ Us. Back on January 8, when I discussed the horrendous spike in Chapter 11 filings in December, I figured that there must have been another cause. The economy is doing OK. In Q4, it was stronger than it had been in prior years, when bankruptcies were much lower. And retailer bankruptcies alone wouldn’t cause that kind of spike. I speculated that that the advent of the new tax law had a lot to do with it. Creditors and shareholders of failing companies knew that they could write off losses in 2017 under the old corporate tax rate of 35%, thus getting the government to pick up 35% of the tab of their losses via lower taxes. In 2018, the new tax law adds uncertainties, but shareholders and creditors knew that losses incurred in 2018 would face the new corporate tax rate of 21%, and so the government would only pick up 21% of the losses. But in March, this logic no longer applies. So it looks like the December spike was a mix of tax consideration and a sharply deteriorating credit environment for companies. This is a sign that the economy has arrived at the end of the “credit cycle.” The Fed is trying to push up interest rates and tighten financial conditions. Weak companies are starting to have a harder time refinancing their debts. And those that succeed face higher borrowing costs. Some sectors are getting hit harder than others, such as brick-and-mortar retail, which had a terrible March. But this is now spreading in other sectors, such as specialized subprime auto lenders.